It does not take much when you look around to see that Iraqis all across the war torn country of Iraq have taken hold of the ideas of free market sentiments and capitalism. 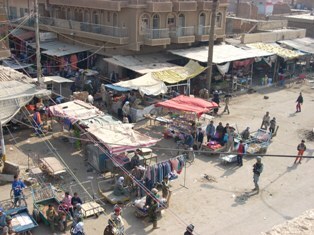 The economy of Iraq is booming thanks to the influx of America dollars. Free market forces and capitalism are running rampant through the capital and around the country. There are street vendors on every street corner in Baghdad who live and breath these economic principles after decades of Saddam Hussein’s oppression. New Businesses. There are new businesses springing up all over the country. There is very little regulation by the country’s government, and there are no taxes that are currently being paid. It is very easy to begin a business. There is a booming wholesale and retail business markets throughout. Almost every other car on the streets is a taxi. Many Iraqi families have put a $10 neon tax sign on top of their car as a way to earn extra income. One Iraqi recently bought a minibus with his friend, starting a full time taxi partnership. DVD Sales. TV and movie production studios will hate to hear that the bootleg trade in pirated movies and television series is booming in Iraq. To have see the industry spring up after the 2003 U.S. invasion of Iraq has been a textbook example of capitalism and supply and demand forces hard at work. When the American forces invaded bootleg movies could be bought by Soldiers for about a dollar apiece. The Servicemembers could even haggle the price down when they bought in bulk. In 2003, black market copies of television shows were almost impossible to find. In 2005, the price of movies began to rise as more Soldiers, contractors, and State Department workers entered the region. Vendors accepted less negotiation on prices. Demand was high, the supply was tight, and vendors’ profits rose. By 2008, more vendors piled into the market. Now, movies are a stable price across the country of $2 a piece or $5 if you buy three at a time. There are so many vendors competing for a finite supply of business, a huge selection of television series are now available throughout the country for only $15. And, we are not talking about one season of Lost. You can buy every season of any TV show for a flat $15. Iraqi Stock Market. Iraq also has had a small stock exchange that has been in operation since 2004. Ninety-four companies are listed on the Iraqi Stock Exchange. Many are local area banks and construction companies. The exchange only handles approximately $1 million USD in volume per day. The Iraqi government has held talks about securities regulation recently in their parliament. The law of supply and demand have firmly entrenched themselves in Iraq as business people carve out new niches of the country’s economy. Free market forces have helped the struggling country increase its economy despite security concerns.